1. 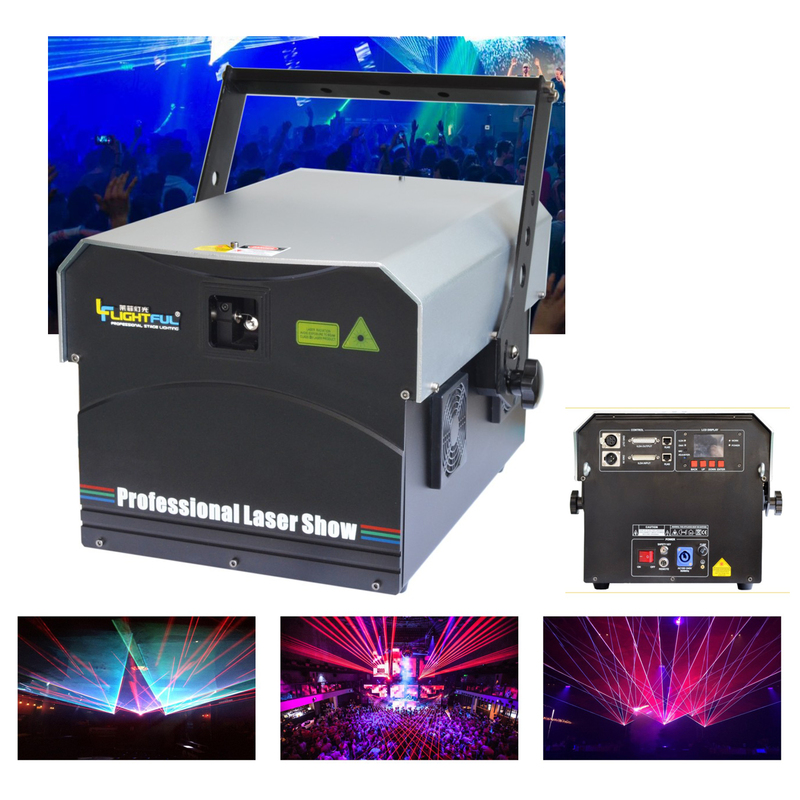 High power semiconductor (LD) full-color laser light, suitable for 800-1000 square meter large entertainment facilities, indoor stadium, medium-sized performance stage, and all kinds of advertising, etc. 2. Adopting OEM synthesis light source, LD laser quality is more stable. Long life, low attenuation, brightness unity, mix color also more better. 3. new LCD panel program. Powerful functions, the interface is complete. With SD card , containing rich programs,can be directly use DMX control directly create the same effect as the laser software for your computer.The built-in various music modes, so newcomers are no pressure, Also supportsRJ45 cable transmission signal, So you no longer worries arrangement of wires. ◎ Control Interfaces :ILDA Standard DB25 Connector,International Standard DMX 512,Phoenix(Germany) or Pangolin (USA) etc,Lightful RJ45. ◎Demonstration effect:Built-in 128 pattern,SD card unlimited storage.By DMX choose pattern scene or SD card laser show. ◎DMX effect: Double pattern modes,and with the function of unique blanking,strobing, rotating, movement, billowing, zoom,drawing,speed and color etc. ◎Security Intelligent function: no signal no emit,Key power,signal is changed automatically(PC to DMX or DMX to PC),Quick Channel, one of the product channels, SD card update online. ◎Operating requirement: dry, less dust, 10~40℃(environmental temperature) ,will reduce the attenuation of the diode and extend the life of the light. ◎Application：Disco, Clubs, KTV, Pub, Vocal concert,Television Station,stadium,Advertising promotion etc.